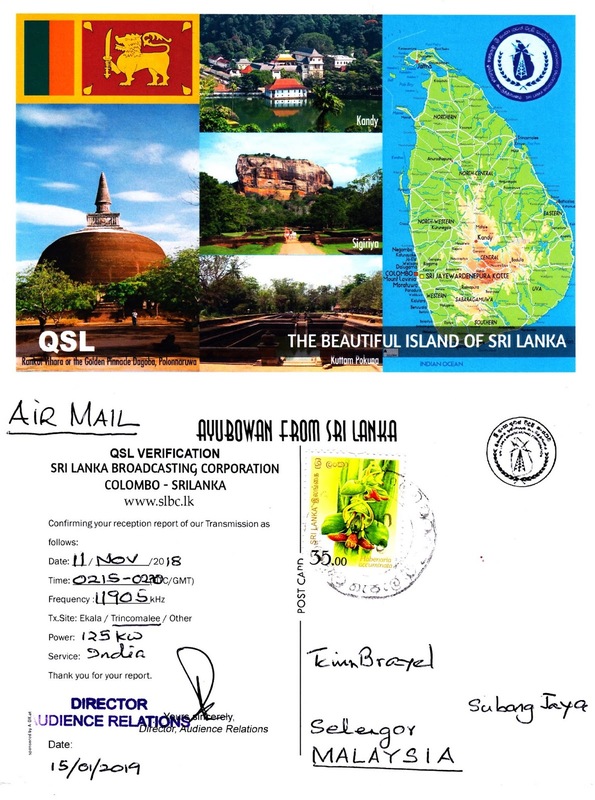 Sri Lanka Broadcasting Corporation, transmitting from Trincomalee, with Hindi programming was observed on 11 November 2018. Transmission was monitored from 02.15 till 02.30 UTC, which included a selection of songs, hosted by a female announcer. Reception on 11.905 kHz rated a (SINPO) of 54544 -- good signal strength and clear audio, despite slight station splatter and fading. The most glaring disturbance was the intermittent loss of audio/transmission feed. HERE is SLBC at sign-off. Reception report was emailed and posted to SLBC as well as Victor Goonetilleke on the same day, and followed up a month later. QSL card arrived in the mail on 4 February 2019. Thank you very much for posting this lovely card, Victor!